« The Sisters of Charity Visit Again. 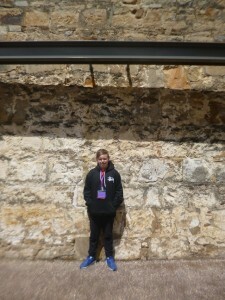 It’s not often that teenage boys are interested in history, especially women’s convict history But Jesse McKenzie proved the exception. Jesse, his parents and sister came to experience Her Story today. His parents had been before and loved it so much they wanted to bring their 2 teenage children who both loved our play. Jesse was such a willing participant in the interactive parts, hiding the tobacco for Mary and telling the Doctor that she was being mistreated! During the time in the Chapel he even insisted on giving Mary her tobacco back because it was safe to do so then! Thanks Jesse and all the McKenzie family for your enthusiastic support. If you are looking for educational, yet entertaining, really unique things to do in Hobart don’t miss our forty five minute play Her Story at the Cascades Female Factory daily at 12 Noon. Jesse McKenzie from Melbourne Loved Her Story.